Cook over medium heat, constantly stirred until all of the moisture is absorbed. Remove the cinnamon stick, set aside and cool it down. 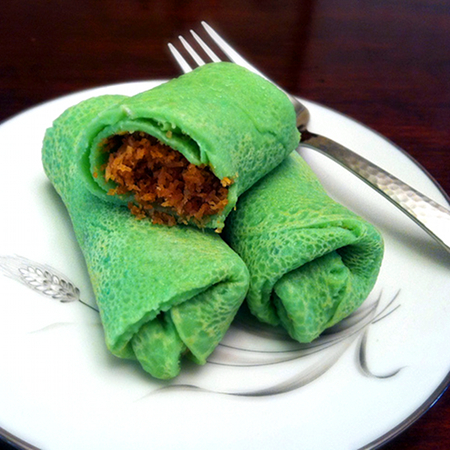 Mix flour, rice flour,coconut milk, egg, pandan leaf paste and salt. Whisk until form smooth batter. Lightly oil an 8-inch frying pan, pour 3 tbsp of the batter into the pan. Make sure that the pan is covered with the batter so it becomes a thin layer of crepe. Fry for one minute, turn the crepe over and fry for another one minute. Remove and set aside to cool down. Place 2 tbsp of the coconut filling in the center of the crepe. Fold the top, then tuck in left and right sides and fold over once more.